Captain Ashley Williams says Swansea City must forget about talk of the Champions League and concentrate on staying true to their principles. Swansea are out of the Premier League's top four after losing 1-0 at Watford. Team-mate Jonjo Shelvey had said previously unbeaten Swansea can secure a Champions League spot but Williams says such talk has its pitfalls. "When everyone's throwing that at you it can take your eye off the ball a little bit," he said. "We can get over that now and just focus on being Swansea City and not worrying if we can get into Europe. "We're just focused on what we're supposed to do." What went wrong at Watford? 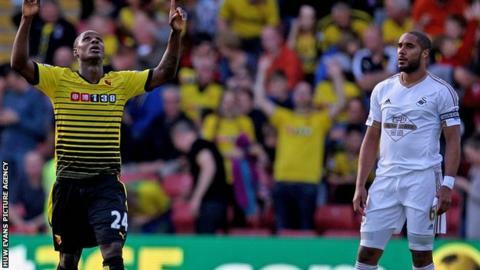 Odion Ighalo's second-half strike earned Watford their first league victory of the season and end Swansea's unbeaten start to the season. Swansea manager Garry Monk accused his side of a lack of focus and Williams says the squad need to regroup ahead of next Saturday's home game against Everton. "I don't think we did well enough. We didn't fight enough and didn't really match their fight in terms of running and doing the basics," Williams said. "We've got to get stick together as always, figure out what went wrong, why we didn't perform and try and put things right. "We've got a good set of lads here that work hard every day and have the right attitude but it's about staying focused. "Everton is always a a tough game. They've been a hood team for as long as I've remembered. "It's a game we'll try and use to bounce back, especially at home."